A man put up a sign in his yard that read: “Puppies for Sale.” Among those who came to inquire was a young boy. “Of course. Maybe we can work something out,” said the man. The lad’s eyes danced at the sight of those five little balls of fur. “I heard that one has a bad leg,” he said. 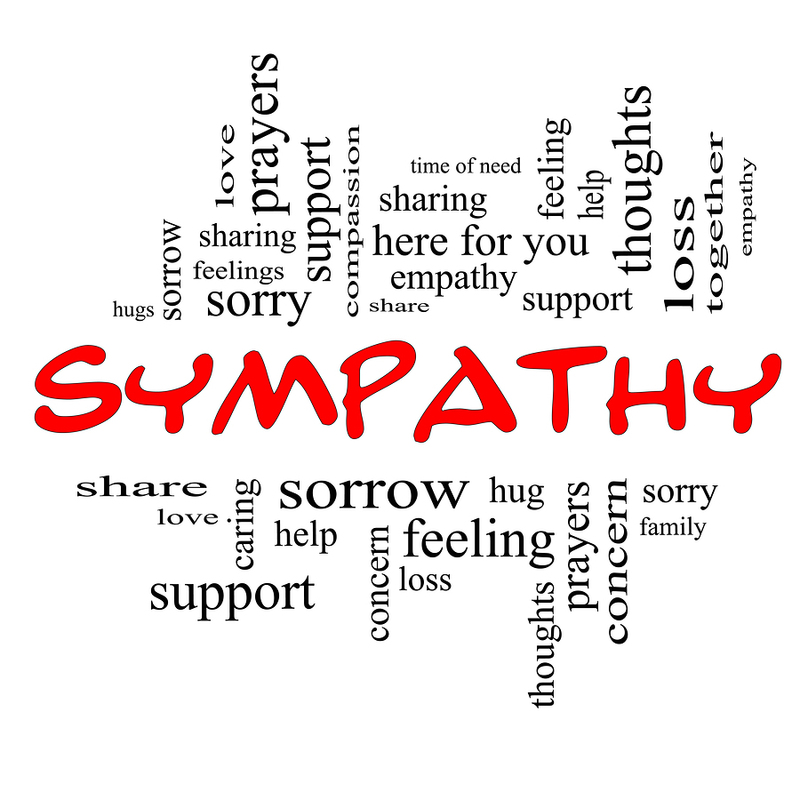 Sympathy is our word of the week. The Greek word means “to suffer with another.” Vincent says it is not limited to sorrow, but is the interchange of feelings for fellow human being, whether or joy or sorrow. It is the application behind Paul’s command, “Rejoice with those that rejoice; and weep with those that weep. Sympathy involves compassion . Empathy. Understanding. It really does feel the pain of another. To better understand sympathy and learn how to be sympathetic take a look at Christ. Luke tells about a time Jesus came into the city of Nain and witnessed a funeral procession. A widow woman’s only son had died. A large crowd of people followed. “When the Lord saw her, his heart went out to her and he said, “Don’t cry.” Then Jesus opened the coffin. And raised the boy to life again. (Lk. 7:12-14). The classic example of sympathy is Jesus’ parable of the Good Samaritan. A man was journeying the dangerous road from Jerusalem to Jericho. Thieves attacked him. Beat him up. Stole his possession. And left him dying. After two religious leaders passed by, a Priest and Levite, Jesus says, “But a Samaritan, as he traveled, came where the man was; and when he saw him, he took pity on him” (Lk. 10:33) But we learn here that sympathy is more than just a feeling. It is moves us to action. The Samaritan stopped. Cleaned his wounds with oil and wine. Bandaged up the bleeding man. Lifted him up on his own animal. Took him to an Inn. Paid for his lodging. And then asked the Inn keeper to look after him. And volunteered to reimburse him for his expense. In a world surrounded by hurt. Sickness. And suffering. Christians should be people of sympathy. May God open my eyes to the pain of other people and help me be sympathetic. Ken, thank you for your daily words of encouragement and support in running the race and fighting the good fight. May our LORD continue to give you strength, wisdom and guidance for many years to come.